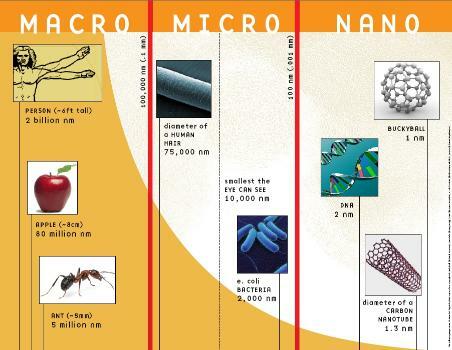 Nanotechnology is the creation and use of devices and materials at nanoscale. To get a picture of just how big a nanometer (nm) is, think of a head of a pin (approximately 1 millimeter). The head of a 1mm pin is 1,000,000 nanometers. A red blood cell that is 2.5 micrometers is 2500 nanometers. Scientists in this field create devices called nanoparticles. In nanomedicine applications, the idea is that these seemingly invisible particles will enter the body and effectively kill all harmful cells, like cancer cells. A major benefit of this treatment is that it kills diseased cells with a greater accuracy, and without the side affects of chemotherapy. Nanotechnology has potential to affect all aspects of our lives, not just medicine. Some products that presently use nanotechnology include sunscreen, clothing, scratch-resistant coatings, and antimicrobial bandages. “Engineers discovered that adding aluminum silicate nanoparticles to scratch-resistant coatings made the coatings more effective, increasing resistance to chipping and scratching.” (1). These engineered particles can be added to the simplest things, such as clothing, to increase quality tremendously. Scientists found that by coating fabric in a layer of nanoparticles, clothing that can give better protection against UV can be made. Nanotechnology will enable us to advance as a species and live longer, more quality lives. Nanotechnology will be another step for every next generation to come. One of the most challenging aspects of the nanoscale is the role of quantum mechanics in it. These rules are very different from physics, which means the behavior of substances at the nanoscale can contradict common sense by behaving erratically. For example, substances that are insulators, meaning they can't carry and electric charge, in bulk form might act as semiconductors when at nanoscale. Much of nanoscience requires that you forget what you know and start learning new rules and principles all over again (1). Another important aspect of nanotechnology is the carbon nanotube. 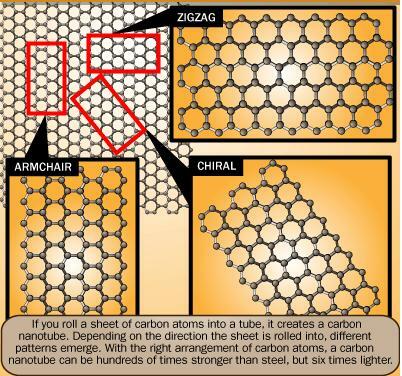 A carbon nanotube is a nano-size cylinder of carbon atoms (see above). With the right arrangement, you can create a carbon nanotube that is stronger than steel, but six times lighter. Engineers are beginning to construct more things out of carbon nanotubes, like cars and airplanes, because lighter but stronger vehicles would mean increased passenger safety and better fuel efficiency. Carbon nanotubes can also be effective semiconductors, and make things like microprocessors, batteries, and other electronics more efficient (1).